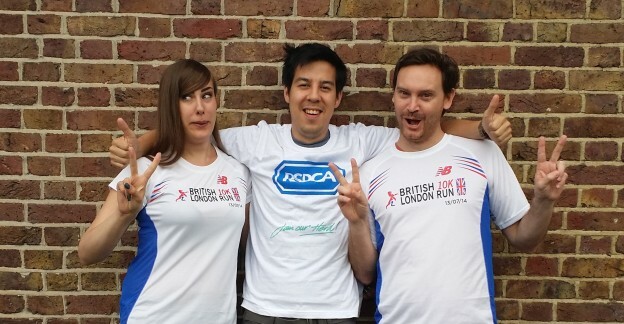 With the British 10k London Run around the corner on 13th July, the focus for our 12 member team is set on training and a final fundraising push. Since starting our fundraising efforts back in April, we’ve raised a staggering £1465 with the help of colleagues, friends and family – 97% towards our £1500 goal for the RSPCA. Training has been ramped up week by week with everyone improving on their personal bests, despite several of the team recovering from running injuries. The latest achievements include a 7k run by Rachel and Tracey racking up 8k geocaching with friends. David and Björn frequently train on weekdays and are very encouraging to us all. We’ve recently received our 10k race packs and the RSPCA have sent us t-shirts – we’re spoilt for choice for what to wear on race day. In my haste to distribute the shirts, I handed David and Jeff ladies’ ones – good thing they were eager to see what they looked like on otherwise they’d be sporting (as Jeff aptly put it) a new “streamlined look”. Check out our JustGiving page where you’ll be able to put names to faces with our gallery of 10k runners and make a donation to the RSPCA. If you’d like to follow our team’s progress, look out for our ‘Featured Runners of the Day’ on the Creative Virtual Facebook page. And if you’ll be in London on Sunday the 13th, make sure you come cheer us on along the iconic race route through the heart of the city.